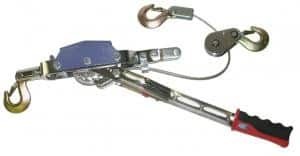 This come-along has 3 hooks with a 2 ton capacity on a single line or 4 ton capacity on a double line. SKU: AFA01. Categories: Tools & Equipment, Yard & Garden, Automotive Tools. Tag: come-along. We DO NOT ship or deliver outside of Colorado! We apologize for any inconvenience! We also refill most PROPANE tanks! Proudly Serving Colorado since 1979!